FAQ No.3 Am I wasting my time? 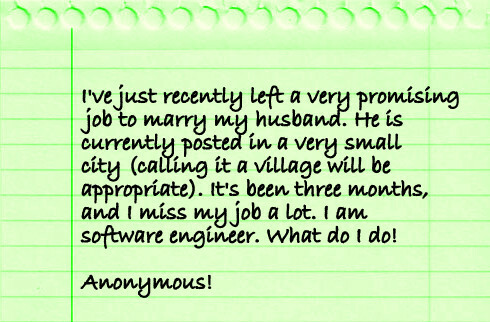 Got a mail from this young girl who is going through what every ‘working woman married to a fauji’ goes through! Your advice can make her life easier… so help out please! Have a look at what some helpful women had to say when I posted this in a Facebook group. Posted in Frequently Asked Questions! Okay everyone! Help her out. We’ve all faced this problem sometime. I received an email in which this question was asked. I was flattered of course, cause if I gave out an I-Know-It-All vibe then I don’t blame the poor gal for thinking that I am an expert. Which I am not. 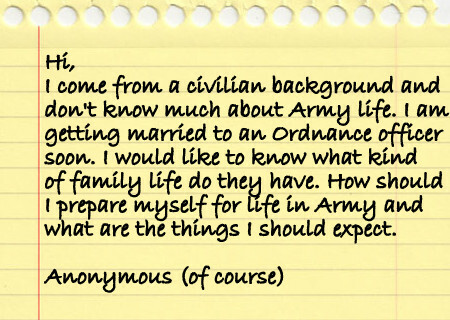 So thought, why not post the question here, so that if any of you have similar questions, you can get experienced Army wives (and officers) to answer it. Post your replies in the comments section. And I’ll make sure that the one who asked the question, reads your advise. 🙂 Got any question? Then mail it, I’ll get people to answer it next time. Pakka promise.